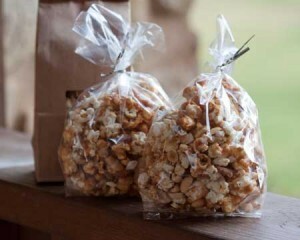 Caramel corn recipe with lots of nuts. Preheat the oven to 250 degrees F. Put the 8 cups of popcorn in a buttered roasting pan. Melt the stick of butter in a saucepan over low heat. Stir in the sugar, salt, corn syrup and molasses. Bring to a boil, stirring constantly. Insert a candy thermometer into pan (I use a deep fry thermometer that can be rested on its metal base) and boil mixture slowly on low heat, without stirring, until the temperature reaches the soft crack stage, about 285 degrees. Kristina mentioned this could take up to 45 minutes, but with a smaller batch I found it took much less time. When the thermometer hits 285, immediately remove from heat and stir in the soda and vanilla. Stir the mixture, then immediately pour evenly over the popped corn in the pan. Quickly mix to coat all the popcorn and spread evenly on pan. Bake for 15 minutes and stir well. Bake for 30 minutes, stirring halfway through. Remove pan from oven and stir in nuts, coating well. Return to oven and bake for 30 minutes more, stirring every 10 minutes. Turn caramel corn out onto nonstick foil or parchment-lined baking sheets in a single layer. Cool completely, then break apart into desired sized pieces. Keep stored in airtight bags or tins.